This release fixes a number of small bugs in both QuickUI and the QuickUI Catalog. The most significant change is in the Control constructor. QuickUI previously went through a lot of trouble to subclass jQuery. This code involved patching up a class when an attempt was made to instantiate it so that the result would be acceptable to jQuery. Specifically, the resulting patched-up class could be instantiated without requiring the “new” keyword. This code was quite complex and brittle, and was eventually broken by a change to the CoffeeScript 1.5 compiler. The CoffeeScript folks graciously backed out that change in CoffeeScript 1.6 so that QuickUI could continue to function. Meanwhile, a workaround had already begun to drastically simplify the Control constructor — in exchange for dropping the ability to instantiate a control class’ constructor without the “new” keyword. As it turns out, QuickUI controls are typically instantiated via the framework itself, either declaratively through Control JSON or imperatively by invoking Control.create(). Only the framework needed to directly instantiate a control class, and so the framework source was updated to always make use of the “new” keyword. In general, despite this constructor change deep in the framework, QuickUI developers should generally observe no changes in framework behavior. The QuickUI Catalog has a few small bug fixes, but the version number has been bumped to 0.9.4.0 to keep in sync with the new version number for QuickUI 0.9.4. Bad news: this week’s release of CoffeeScript 1.5 is incompatible with even the current QuickUI release, 0.9.3. Possible fixes are being investigated, but this issue runs very deep, and a number of straightforward workarounds have already been ruled out. A real fix will likely require a substantial change to the way QuickUI instantiates controls. For the time being, it is recommended that QuickUI developers use CoffeeScript 1.4.0. The QuickUI Catalog has been updated to version 0.9.3.1. This is a modest update in terms of functionality, but a significant milestone for the catalog — it represents the culmination of an effort to port all the Catalog controls to a combination of CoffeeScript and LESS. The original QuickUI framework included the use of a local build tool called the QuickUI markup compiler. This compiled a markup format that was essentially HTML plus the use of custom tags. (In this, the format was remarkably similar to the spec’ed format for Web Components.) Because this format never got any traction, it was eventually deprecated, although still used for the vast majority of the Catalog controls. 2013 has begun with a major push to port all these controls to CoffeeScript for content and behavior and LESS for appearance. ToggleButton is a button that can track a selected state. This can be used as is, or as a base class for custom toggle classes. Link wraps a standard HTML <a> tag, and can be used as a base class for custom link classes. TextBox wraps a standard HTML text input element, and can be used as a base class for custom text box classes. A new Control member called Control.browser replicates the behavior of the now-deprecated jQuery.browser member. jQuery is quite reasonably trying to encourage people to use feature-detection libraries like Modernizr instead of looking directly at the user agent to determine behavior, and jQuery 0.9 is removing support for jQuery.browser. However, in developing the QuickUI Catalog controls, minor bugs have been found time and again in specific browsers to prevent controls from working correctly. These bugs are the sorts of things that will never be detectable with a feature-detection library, and hence checking the browser’s user agent is the only practical way to ensure cross-browser compatibility. A new TextBoxWithButton control covers the common UI pattern of a text box with an adjacent button (often labeled “Go” or something similar). The existing SearchBox control has been refactored to derive from TextBoxWithButton. A new Log control handles the common need to log text output (e.g., from a background process) to the page. Using $.control( element ) on an existing element to cast the element to the correct subclass of Control now returns null (instead of undefined) if the given element is not a control. A bug has been fixed which prevented quickui.js from loading in IE8. Thanks to QuickUI user Toussaint for reporting this bug and helping to test the fix! Modes now derives from a new base class called Sequence, a general-purpose class for any linear sequence of elements that can be navigated via a next() and previous() method. Modes now focuses on showing just one element of a Sequence at a time. As part of this change, Modes.activeChild() has been renamed to Modes.activeElement(). SlidingPages has been renamed SlidingPanels (since its contained elements aren’t necessarily pages). The class now also derives from Sequence. Finally, SlidingPanels has been updated to take advantage of CSS transitions on browsers that support them, falling back to a jQuery animation on older browsers. LateralNavigator has been refactored to handle two general cases: first, navigating through a Sequence of elements, and second navigating through an abstract axis like time. The former case is specifically addressed with a new class called SequenceNavigator. The latter case is used in CalendarMonthNavigator. An issue that prevented CalendarMonthNavigator from correctly vertically aligning its heading elements has been fixed. CalendarMonthNavigator now also uses a new class, MonthAndYear, to show both the month and year instead of just the month name. A new VerticalAlign class handles the general problem of vertically aligning child elements in older browsers. A new Carousel class derives from SequenceNavigator, and uses a SlidingPanels class to provide a sliding transition between elements in the sequence. The TabSet class has been renamed to Tabs. This release is also notable as the first one in which Catalog controls have been written (and, some cases, rewritten) in CoffeeScript. At last week’s Google I/O 2012 conference, Chrome engineers Alex Komoroske and Dimitri Glazkov gave a talk called, The Web Platform’s Cutting Edge, a good overview of Web Components and custom elements in particular. The demo code shown in that presentation does point to an issue with the current Web Components spec that could seriously constrain the ease with which components can be written and shared. I’ll lay out the case here in hopes this problem can be fixed at an early stage. Authoring a spec for a new standard like Web Components is generally a thankless task, as is the tireless work of promulgating the standard through presentations like the one at Google I/O. So, before saying anything else: a big Thank You to Alex and Dimitri for their work on HTML Templates, Custom Elements, and Shadow DOM. Everything which follows is meant to support your work, not put it down. This poll user interface is a large component comprised of sub-components for accordions (or, later in the demo, tabs) and the big iconic choice buttons in the poll for “Semantics”, “Offline & Storage”, etc. All these components are defined with declarative markup. However, one aspect of the code really jumped out at me as a serious limitation of the current spec: a component host can only pass a single DOM content subtree to the component. As I’ll try to show, I believe that could seriously limit the degree to which a component can expose a meaningful API. So the first code fragment effectively defines a choice component with three public properties (although these aren’t actually class properties). The second code fragment shows the creation of two instances of that choice component, filling in two of the three choice properties. It’s not shown where the icon property is filled in, but it’s presumably done through styling. All looks fine so far, but there are some serious issues lurking here. Asking developers to tease apart component content will mean work for devs, and produce inconsistent results. Why, exactly, is the choice component using the <h3> tag to specify the text label for the button? Because this component has two textual properties, and the current Web Components spec only lets the developer pass one DOM content subtree to a component. So the component’s author developer has to somehow let the component’s users pack more than one property into the content, and then the dev has to crack that content to extract those properties. The question of how to crack that single content subtree into multiple properties is left entirely up to the developer. The tool given to the developer for this purpose is CSS selectors, which at first glance seems powerful. Unfortunately, it’s also a recipe for inconsistency. Every developer will have the freedom—and chore—to approach this problem their own way, guaranteeing the emergence of a handful of different strategies, plus a number of truly bizarre solutions. It’s as if you were programming in a system where functions could only accept a single array. As it turns out, we already have a good, common example of a such a system: command line applications. Every command-line application has some main() function that’s handed a single array of command line options, and the application has to decide what to do with them. Although conventions eventually arose with respect to the order and meaning of arguments, there’s still a wide variety of approaches. Some apps rely on argument position, some rely on single-letter flags (“-a”), some rely on full-word named parameters (“–verbose”), some have idiosyncratic microgrammars (e.g., chmod permissions), and many applications support a rich combination of all these approaches. Parsing arguments is tedious, boring work. In the early days, a developer throwing an app together might do the absolute minimum work necessary. The result was often inconsistent or incomplete argument support. The dev might eventually be forced to hack on their app until they finally had a roughly functional command line parser. These days, developers can rely on language features, or libraries like Python’s argparse, to “crack” the argument array into a meaningful structure which can be more easily inspected. In particular, it’s invaluable to a developer to be able to directly inspect specific arguments by name. The use of CSS selectors does remove some of this tedium, but it still leaves devs without a consistent way to refer to component properties by name, thereby leaving the door wide open for inconsistency. A dev might decide to use DOM structure, HTML tags, element classes, or a combination of all of these to demarcate properties. This will make it much harder for devs to share components, to swap out one component for another, and so on. It would be better if we could learn from the command-line argument example now and head off this inconsistency. HTML semantics are nearly meaningless when used to identify parameters. In the Google I/O demo, the developer of the choice component elected to use HTML tags within the single content subtree to identify properties. In this case, they decided that the first <h3> element in the content would identify the summary text, and everything else would be used as the longer text description. But why use <h3> for this purpose? The W3C spec says a heading tag like <h3> should be used to, “briefly describe the topic of the section it introduces”. These choices aren’t introducing sections, so that can’t be the the case here. Neither is this <h3> being used to reflect the rank of an element in a hierarchical document structure. In all likelihood, the <h3> is used here, as it often is in practice, to mean something like, “somewhat prominent, but not too prominent”. Visually this usually translates to, “bold text, a little bigger than the body text”. At least, that seems to be how <h3> is being used in this component. There’s nothing really wrong with that, but it’s clearly arbitrary. Other developers might easily make a different decision. Later, in the very same demo, the code for the poll component accepts the text label for a different Voting button through the use of a <label> element. So in one place in this app, a button’s label is specified with an <h3>, but elsewhere in the same app, a button’s label is specified with a <label>. I don’t think this reflects any particular negligence on the part of the demo’s developers. I think it’s a latent issue in any scheme that relies on HTML elements for something than the original purpose. Perhaps the code’ s developers did have some reason in mind for using <label> in one place and <h3> in another, but the point is that the reason is not obvious to another party looking at the code. The same arbitrary nature of tag choice here applies to use of the <aside> tag to identify the choice description. Try this: show the poll screen shot above to 3 web developers, and ask them which HTML tag they would use to specify the tooltip that should appear when the user mouses over a choice button. I’d be surprised if even one of them picked the <aside> tag. Is the tooltip content here really, as the W3C description says for the <aside> element, “tangentially related to the content around the aside element, and which could be considered separate from that content”? Well, not really. But, maybe; that’s a debatable point. The fact it’s debatable is what’s at issue here. In contrast, here’s a tautological statement which wouldn’t generate debate: the choice description in the tooltip is the choice description in the tooltip. The local semantics here aren’t in question. So it’s a shame the property can’t be described in contextual terms like “description”, or “tooltip”. The fact that the component is using HTML elements to identify arguments appears sensible, but in practice will be nearly meaningless. Every single time a dev needs to create a new component property, they’ll pick from the 100-odd HTML elements. Their selection may depend on their experience, their mood, the phase of the moon, and which handful of HTML elements they haven’t already used for other properties on the same component. It’s highly likely a different developer (or the same developer on a different day) would make a different selection of HTML elements for the same properties. Imagine an object-oriented programming language that forced you to give class properties one of 100 sanctioned property names: “index”, “count”, “name”, etc. Evereyone’s classes would look consistent, but it would be an utterly false consistency. That’s effectively what we’ll get if component authors are forced to choose HTML tags to identify component properties. 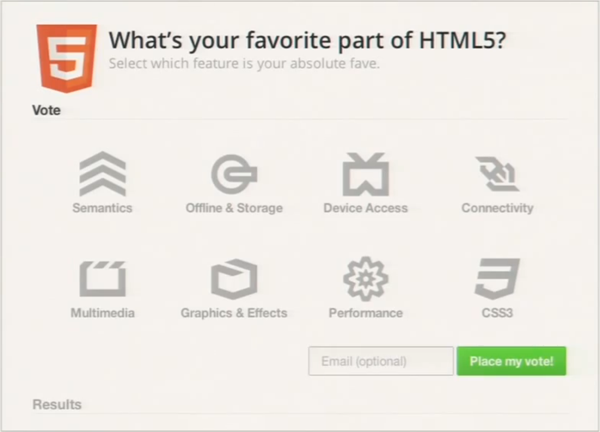 Use of CSS selectors hinders a developer’s ability to add new properties. Suppose the author of this component needs to add a new property to this choice component. Maybe they want to add a “More about this choice” link to each choice; this link should navigate to another page with more details on that poll choice. Following the example of the <h3> for the choice summary, they decide to define this link property by extracting the first <a> tag in the content to be the link to the “More about this choice” page. The “a:first-of-type” selector for the “More about this choice” link will accidentally pick up the existing link, thereby breaking this use of the component. The component author could issue a “Breaking Change” notice, warning everyone to include an <a> tag before the choice description. But even that wouldn’t help someone who, for whatever reason, needed to embed an <a> inside of the <h3>. The use of selectors here could be made more robust by using the child selector “>”, as in “> h3:first-of-type”. But this gets verbose, and again, isn’t likely to be a universal convention, and inconsistent use of the child selector will only add to the confusion. The fundamental problem is that using CSS selectors for this purpose is inherently fragile. Arbitrary parameter structure is brittle. The fragility of using CSS selectors remains even if one tries to avoid the use of arbitrary HTML elements. Suppose you decide to use element position to identify components. You’ll still up a component which is hard to update. To avoid these problems, programming languages tend to eventually evolve named function parameters. Functions with named parameters are inherently more future-proof and, importantly, allow callers to only specify the parameters they care about. The lesson of positional function parameters applies to trying to parse component properties out of the DOM content subtree. Having learned this lesson in countless programming languages, it would be nice to just jump straight to a reasonable solution which allowed for named component properties. While CSS selectors represent a powerful parsing tool, much of that power is completely unnecessary in this context — and some people will inevitably put that extra power to poor use. Subclasses will compete for parameters with their base classes. The above situations quickly deteriorate further when one envisions extending an existing component via subclassing. Subclassing is a crucial means of efficiency in component development, in which the behavior of one component can be specialized for new purposes. As just one case, over 33% of the controls in the QuickUI Catalog are subclasses of other Catalog controls. For example, both DateComboBox and ListComboBox extend ComboBox, which itself extends PopupSource. This separation of concerns is vital to keep the code clean, organized, and maintainable. This significantly complicates point #3 above (using CSS selectors to pull out properties from the DOM content subtree makes it hard to add new properties). Consider a subclass of the choice component above called, say, special-choice. Perhaps the author of special-choice has decided to use the HTML <h4> element to identify a particular property. Now the author of the base choice component decides to add a new property, and elects to use <h4> for this purpose themselves. This has the effect of breaking the special-choice subclass. Obviously, such naming conflicts can arise in regular OOP classes, but here the likelihood of conflict is much greater because of the highly constrained vocabulary of HTML elements. Using DOM structure to select properties (point #4, above) is even more brittle when one considers subclasses. If a component class decides to use DOM element position to select content for a given property, and someone creates a subclass that likewise uses element position, the original base class’ API is effectively frozen. Suppose the base class defines a <content> element with selector “:nth-child(3)” , and the subclass goes ahead and uses a <content> with selector “:nth-child(4)”. How is the base class supposed to add support for a new property now? They can’t use position 4, because a subclass is already using that. The situation could be worked around by requiring not just specific tags, but also specific class names, but this has problems of its own (see below). As currently drafted, the Web Components spec seems highly likely to close off the possibility of rich component hierarchies. Most component developers will probably elect to just copy-and-paste useful code from other developers, rather than subclassing them, to preserve the ability to modify their components in the future. Class names could help identify properties, but will probably just complicate everything. This could potentially work if everyone agreed to always using an element class name to identify a property, and consistently applied those classes to a single element type (likely <div>) which everyone agreed upon would stand for “parameter”. Unfortunately, the more likely result is that throwing element class names into the mix will just complicate everything further. Some devs will write their components that way, but others will insist the use of HTML elements as shown above. Some will require the use of both specific HTML elements and specific class names. E.g., the choice component’s summary property will be forced to be identified with <h3.summary> to avoid possible conflicts with other <h3> elements in the content. This would be verbose and, worse, as a component user you’d have to remember and specify two things, when one should be sufficient. Invisible component APIs foreclose the possibility of inspection and reflection. The choice component in this example effectively presents its hosts with an external API that allows the host to fill in two text properties. Unfortunately, that API is implicit in the design of the <content> elements and their selectors. That makes it hard to programmatically understand what a component is doing. At design time, there’s no easy way to statically analyze the code to inspect what those <content> elements are actually being used for. You could potentially parse the HTML to find the <content> elements, then parse their CSS selectors, but that still wouldn’t give you any hints as to what those <content> elements were being used for. At least a formal property name gives you a real idea as to its purpose. And at runtime, there would be no easy way to ask a choice component instance questions about which properties it supports: “How many properties do you have?”, or “Do you have a ‘description’ property?” Such run-time inspection of a component’s API (also known as reflection) can be a powerful tool. In this very presentation, Google’s developers point toward the benefits of programmatic inspection when they observe that giving web developers the ability to create new custom elements (via the <element> tag) will open new possibilities in researching possible improvements to HTML itself. For example, researchers could statically inspect Web Components actually used by production web sites to determine, for example, the names of the most common custom elements. That in turn could help guide the formal adoption of new HTML elements in future versions of the language itself. That’s just one example of what’s possible when APIs are explicit. Such explicitness should be extended beyond component names to cover component property names as well. Proposal A: Use a consistent tag for component properties. If <param> can’t be redefined this way, then a new tag like <property> could be created. If HTML semantics zealots insist on mapping component content to HTML elements, it’d be possible to let define a component author identify a backing HTML semantic tag that should be used to treat the property’s content for search and other purposes. E.g., syntax within the <element> definition would indicate that the “summary” property should be backed by an <h3> element. This is exactly the way that the <element> tag’s “extends” attribute is already spec’ed to work. The author indicates that an <x-choice> element is backed by a <div>. In the exact same way, the author could indicate that a <param> (or <property>) of name=”summary” should be backed by an <h3>. As noted above, the particular choice of backing HTML element might be inconsistent or meaningless, but at least use of a backing element confines the problem to a much smaller audience. That is, the component users shouldn’t need to know that summary property behaves like an <h3>, just like they don’t have to know that an <x-choice> behaves like a <div>. Rather, that would be something only the component author would need to concern themselves with. The data- element form would only need to be used when specifying a real DOM subtree with subelements; otherwise, the data- attribute form could be used. As with the data- element approach above, this custom property element approach could also support the use of a data- attribute on the element tag itself when specifying a simple string property value. The cleanliness of the code above comes at the cost of an ambiguity: if you can define your own element tags and property tags, how does the parser know which is which? In the code above, is <summary> a property of <choice>, or is it a custom element in its own right? One resolution would be a precedence rule, e.g., if <summary> is a child of a parent that has a summary property, then treat it as a property, otherwise instantiate it as a custom element. Another resolution would be to follow what Microsoft did with XAML’s property element syntax: allow (or require) the property to be written as <choice-summary>. As noted above, if HTML powers that be insist on mapping component content to a fixed set of HTML elements, that could be handled by letting a component author indicate the HTML element which should be used to back each property. Again, that would relegate the problem to something that only the component author would have to worry about. The writer of the code above that hosts the choice component wouldn’t have to obsess over the question of why <aside> was picked instead of <label>; that detail would only be visible by reading the code for the choice component. The host author only has to deal with <summary>, which has local meaning. In any event, the above code sample is clean, and should serve as a goal. Such code would be a joy to write — and read. It moves HTML definitively towards the creation of domain-specific languages, which is where it should go. It’s somewhat absurd that we can only define markup terms according to global consensus. That’s like waiting for a programming language committee to approve the names of your classes. The web will move forward at a much faster pace if we can let individual problem domains (online stores, news sites, social networks, games, etc.) define their own tags, with semantics they care about and can agree upon. As the aforementioned uses of <aside> and <label> illustrate, forcing developers to use HTML elements may give the appearance of consistent semantics, but that consistency is merely a facade. In contrast, letting polling organizations define the meaning of a <summary> property for a <choice> component could produce meaningful consistency within that industry. In their presentation, Alex and Dimitri indicated that their goal is not to spec out a complete replacement for web UI frameworks. Rather, the goal of their work is to lay a solid foundation on top of which great web UI frameworks can be built by others. In this light, it is hoped that the Web Components spec can be amended to support multiple, named, DOM-valued properties — because that’s exactly the foundation a great web UI framework is going to need. The QuickUI framework, at least, is more expressive with regard to component content than is possible within the current Web Components spec. That is to say, the existing Catalog of QuickUI controls (and the many others controls written in the service of specific QuickUI-based applications) could not be ported to the current Web Components spec. Or, perhaps, those controls could be ported — but then, for the reasons given above, the collection would then become so brittle that its evolution would come to a halt. That would be a shame. To be sure, the Google team, and the others working on Web Components, are smart folks, and it’s likely they’ve already given at least some thought to the problems raised in this post. But more input, particularly when informed by real application experience by potential users of a standard, is always valuable in weighing decisions about what should go into the standard. And it’s in that spirit that this post is written.